Cut onion in half and then cut each half in quarters. Place onion, stewed tomatoes, garlic powder, oregano and cinnamon in a medium size saucepan. Simmer the mixture for about 5 minutes or until onions are translucent. Remove the tomato mixture to a bowl with a slotted spoon, leaving the juice in the pan. Slice the zucchini and add to tomato juice in saucepan. Simmer the zucchini for about 3 minutes, then remove with slotted spoon and add to the reserved tomatoes. Add the cornstarch to the water, mix well and add to the remaining tomato juice left in pan. Bring the mixture to a boil, stir constantly until it thickens. Remove from the heat and add salt and pepper to taste, if desired. 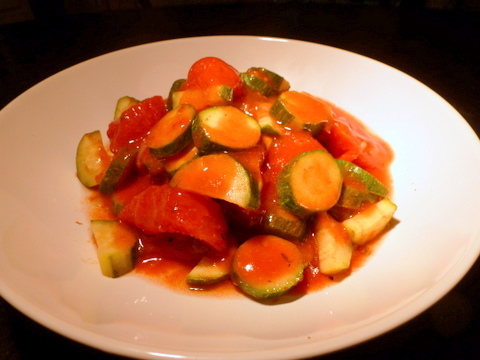 Return the tomatoes and zucchini to the pan and gently coat with thickened tomato sauce. Sprinkle with optional parmesan cheese and serve warm.